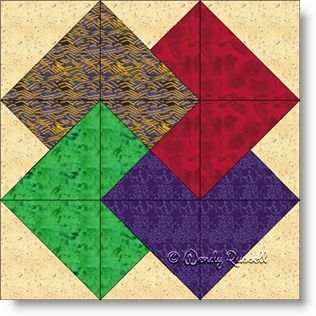 The Card Trick quilt block is an old favourite nine patch and has been around for many, many years. Half square triangles and quarter square triangles are plentiful in this block, so it is a good learning experience. The sample quilts illustrated show only the one colour selection used for multiple blocks. However, this block is a nice choice to use in order to delve into your scrap "stash" to use a lot of different colours for the cards in the many blocks required for your quilt.